Redi was born and raised in Korçë, Albania. He moved to the United States with his parents and younger brother in 1994. At the age of twelve, He landed his first job at a catering facility in Bridgeport, CT; where he was a bus boy and dishwasher. Six months later, He had worked his way up to Prep Cook and held his position at the catering facility for the next five years! 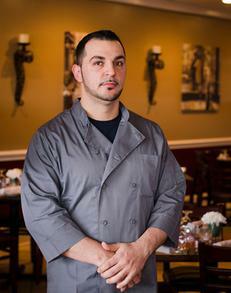 After graduating from Central High School in Bridgeport and becoming a father in 2002, He then attended The Center for Culinary Arts in Shelton for fifteen months. Once he graduated from culinary school in 2004, he continued to rise in rank over the next few years; from Line Cook to Sous Chef and then to the top as an Executive Chef. In the year of 2011, He had finally established himself and made his mark in Orange, CT as the Owner and Head Chef of Andini’s Restaurant/Pizza. Redi is truly an amazing Chef. He cooks with the freshest ingredients and aims to please his customers, treating everyone like they are apart of his ever growing family.